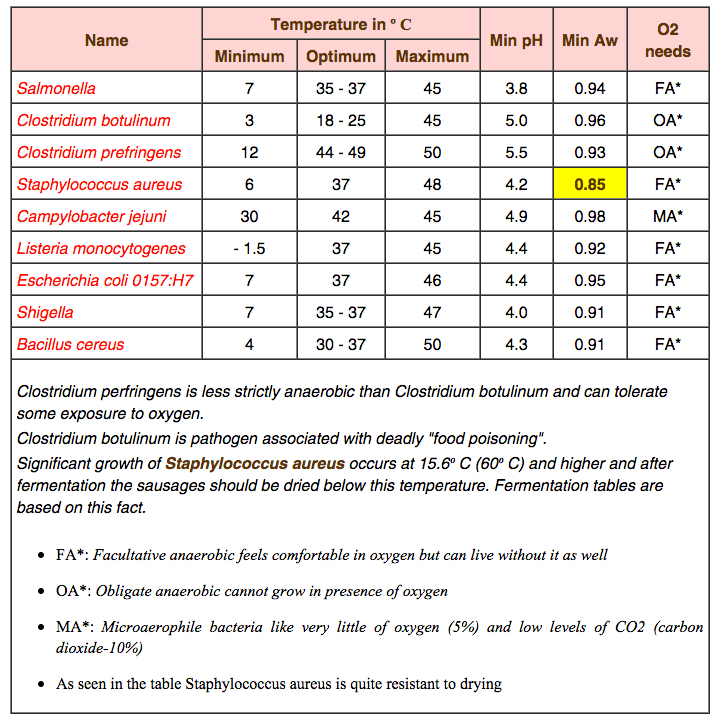 The reason water activity is important, and the reason why the USDA critical limit for fermented sausages is 0.85 is because of Staphylococcus Aureus. It can withstand water activity to 0.86, which is why I mentioned in my previous post that you have to dry to 0.85. This chart does an amazing job summarizing all the pathogenic bacterial hurdles. You see, drying is regarded as the “kill step” for Staph. as it can tolerate low pH. So the only other way to guarantee the kill step is by water activity. As you can see getting to a water activity below 0.91 ensures the death of most pathogenic bacteria, but your worry is pH now, as some pathogens can survive in very low pH. Think, your worry now is Staph. and Listeria, as they can now survive a pH of 4.4 or 4.2. Well, you never ferment salami that low on the scale, because it would be so sour and unappetizing. On top of that as the salami dries the pH is raised. So you may ferment to 4.9, which is optimal, but by the time the product is done aging the pH of the product can be around 5.2. So then what are your only other ways of verifying the death, as when we dry salumi we generally dry between temperatures of 55-60ºF (which is Staphs. optimal growth temperature)? Well, lowing the aW in combination with raw batter testing. As you can see with Listeria even below a aW of 0.92 it is possibly suppressed, but not eliminated as the pH limit suggests. That is why a CCP is identified as “raw batter testing”. You test it for Listeria, but testing for Staph. as well wouldn’t hurt, but it is more expensive. This all has to do with pork products! If you plan on making a product with beef you now have an E. Coli hurdle to fill, as it can with stand low pH and pretty much everything. The only concrete evidence out there for the death of E. Coli is a heat step, but we don’t want to cook our product! Now you have to have the product tested for yet another pathogen if using beef in formulations. NOW… for the home enthusiast it is just GOOD TO BE MINDFUL of these pathogens, and to make sure your methods utilize the kill steps. Yeah, it is unlikely you’ll get Staph. if you dry to 0.89, but from a production standpoint its against the law.